Watercolour of the High Alter at St Albans Cathedral, in Hertfordshire. The Cathedral building was originally constructed in the 11th century and has been re-built and refurbished at various times in its history, most significantly in the 12th and 19th century. This means that the building is an interesting mixture of Norman, Gothic and Vicrotian architecture. 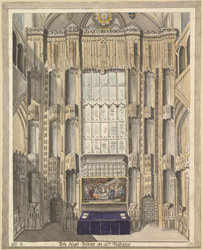 This watercolour depicts the reredos or ornamental screen, which covers the High Alter at the Cathedral. It was completed in 1484 by Abbot William of Wallingford at a cost of eleven hundred marks. The panel above the Alter portrays the Resserection of Christ and was made by Sir Alfred Gilbert R. A.